I came across the Weight Stigma Blog Carnival thanks to a post I found on the Body Peace Corp's Facebook page. The Body Peace Corps is a student group at the University of Michigan that promotes healthy body image among college students and teenagers. 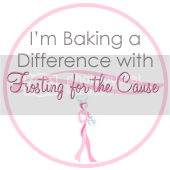 I became involved with this group last year and have thought of it many times since I started this baking blog. More specifically, I think of it when I ask myself, "can I be a health conscious baker or is that an oxymoron?" I also think about the Body Peace Corps whenever I find myself straying from thinking "healthy" to thinking "thin." In today's weight-obsessed society, remaining health-focused rather than weight-concerned can be difficult. As soon as I finished reading the information and rules for the Weight Stigma Blog Carnival, on voiceinrecovery.com, I knew I was going to take part in this series of events. Essentially, I will post a blog on the last Wednesday of every month for the next three months regarding weight stigma until Weight Stigma Awareness Week September 26-30. The first topic that all participating bloggers are responding to is simply titled: What does weight stigma mean to you? Easy enough question, except for one thing: I'm not so sure I even know what weight stigma even is! You might be asking what exactly is weight stigma? Well, weight stigma is bullying, teasing, negative body language, harsh comments, discrimination, or prejudice based upon a person’s body size. "Are you sure you want to eat that?" "Do you know what you weigh these days? ... And is that the most you've ever weighed?" "Careful there. Big bones run in the family." To me, it seems like no one is immune to the effects of weight stigma. The skinniest of us are told, "eat more, put some meat on those bones," while the heavier victims are encouraged to skip dessert or try so-and-so exercise regimen or diet. Somehow "thin" has become a synonym for "doesn't eat enough" or "dangerously obsessed with weight," while "heavy" symbolizes "eats too much," "lazy," or "doesn't work out." And "healthy?" Eh, take it or leave it. If you read any popular magazine you may come to the conclusion that healthy diet, healthy lifestyle, or genetic differences in metabolism no longer play a role in weight. Instead your weight is about quantity: how much you eat and exercise. To me, weight stigma represents the loss of ability to distinguish between health and weight. Weight stigma is the loss of finding enjoyment in food. Weight stigma is the fear of eating dessert. As a baker, I know very well that too much consumption of my delicious goodies with their high sugar content can contribute to weight gain. I also know that eaten in moderation, the consumption of such devilish desserts can have minimal or no effect on a person's weight. Sometimes the treats I make can even be nutritionally beneficial. (in moderation!) Think of the recipes I recently posted for patty pan squash muffins and dark chocolate cherry brownies. Studies have linked consumption of dark chocolate to improved cardiovascular health and patty pan squash is a decent source of Vitamin C and potassium. Having majored in Nutrition & Exercise Sciences I am beyond happy to read this post. I find it so frustrating the amount of people, especially young girls who still equate healthy with thin. I'm glad to hear that there are more and more organizations striving to eliminate the weight stigma! great post ! Very well said. There is hope for future acceptance of "girls come in all sizes and shapes" and "destigmatizing" as too much of what we see on TV or magazines with air brushed pictures is hurtful and untrue.